Charles Goldenberg was born in Russia but moved to Paris with his parents in his infancy to escape the persecution of the Jews. He became a jeweller in the 1930s and married Huguette Cevert. They had three children although the youngsters were given the name Cevert to avoid the Nazi persecution of the Jews after the German invasion of France. 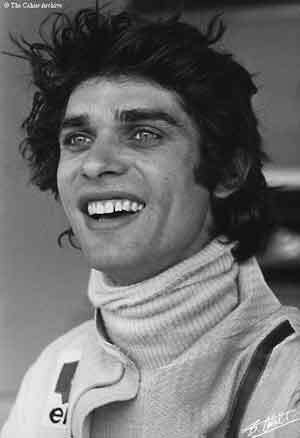 Albert Francois Cevert was born in February 1944. When he was in his teens his elder sister Jacqueline became involved with a racing driver called Jean-Pierre Beltoise (whom she later married) and the young Francois was drawn into the racing world. At 16 he was racing scooters with his friends on the streets of Paris and then tried karting. At the end of 1964 he went to the racing school at Montlhery. He then spent two years doing his national service and at the end of 1966 he entered the Volant Shell competition and beat Patrick Depailler to the prize: a fully-sponsored season in French F3 with an Alpine-Renault. At the end of the first season he was offered a factory drive but turned it down and raced a Tecno instead and won the French title that year. Cevert made his F2 debut that year with Tecno and won at Reims in a non-championship race. He also made his Grand Prix debut in the F2 class of the German GP. In 1970 he stayed with Tecno and raced Matra sports cars as well until Johnny Servoz-Gavin retired from F1 in the mid-season and Ken Tyrrell took on Cevert to be Jackie Stewart's team mate. He started at the Dutch GP and was soon scoring points. At the French GP the following year Stewart and Cevert finished 1-2. At the end of the year Francois won the United States GP. As Stewart's pupil, he raced successfully in F1 and F2 in 1971 and showed his versatility by winning in touring cars and CanAm. The 1972 season was rather disappointing but he did finish second at Le Mans that year in a Matra. Francois Cevert was being groomed to take over as Tyrrell team leader in 1974 but was killed while battling for pole position during qualifying for the 1973 US Grand Prix when the car flipped and landed on top of the barrier.